Sure, we all love Grumpy Cat. 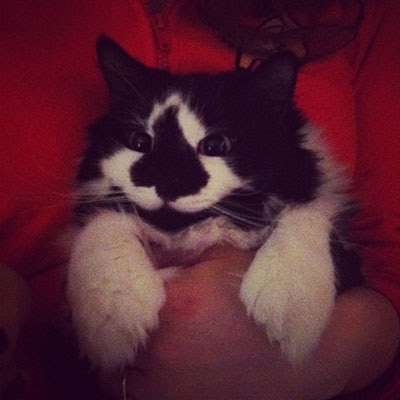 But every once in awhile, it doesn't hurt to admire a feline who isn't afraid to turn that frown upside down. According to Reddit user sketchampm, "Ridiculously Happy Cat" showed up meowing on a friend's porch one day, and they've kept her ever since. 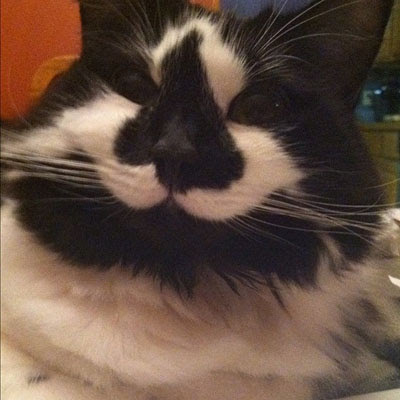 The pretty kitty's unusual markings make her appear to have a permanently upturned grin, that can't help but make you smile. I think we can all agree, though, that those seriously adorable bunny paws are no joke! Like the cat who ate the canary. How adorable. So pretty. Does look like a happy smile. Oh, we love her! Those markings and feets are something else! Congrats on your new shop Miss Catsparella, we are going over to take a look...and Happy Belated Birthday Priscilla! that face! i want to kiss the kitty! That is too cute ! 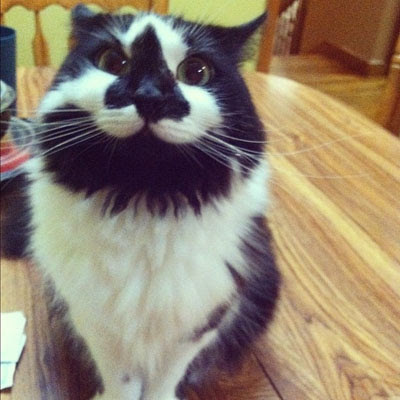 Happy cat is absolutely wonderful!